Is it wrong to use Paula Dean cupcake holders when making a Martha Stewart recipe? I hope not. 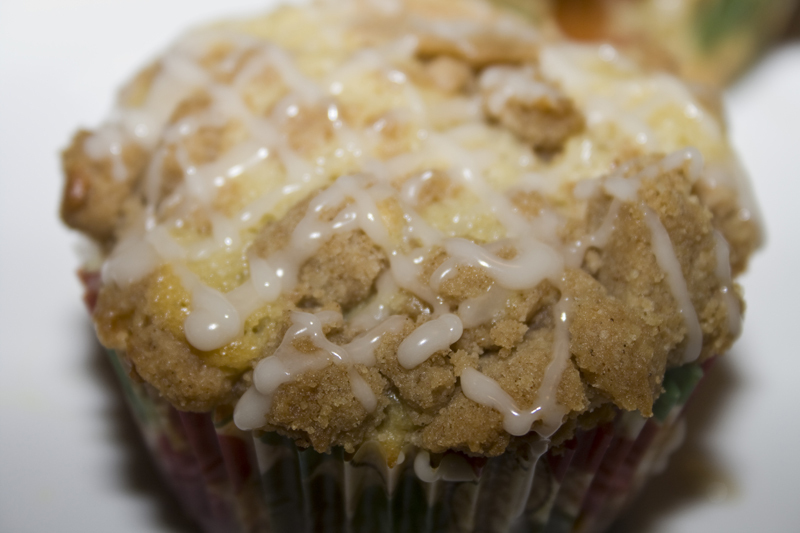 Cause if these coffee cake muffins are wrong, I don’t want to be right. Coffee cake is superb in general, but individualized servings in a sweet cupcake wrapper is just downright evil. Resistance is futile when you don’t even need utensils to indulge in this moist cake smothered inside and out with delicious streusel. What caught my eye when I found these muffins (aside from how pretty they are) was that you put the crumbly topping inside the cake as well as on top. Double streusel? Yes please! Making the muffin top extend thru the entire muffin is sheer genius! First prepare your pan. Aren’t these cupcake liners cute? I got them from my secret prayer pal. Thanks Sarah! Spray the pan on the top part (where the liners don’t cover) with a non-stick spray before you put the paper liners in. You’ll see why later. Pulse together some butter, brown sugar and flour. Until it makes a sandy crumb topping. Then we’re going to make our cake batter. More butter, flour, eggs, sugar – your standard cake ingredients. And a little something extra. 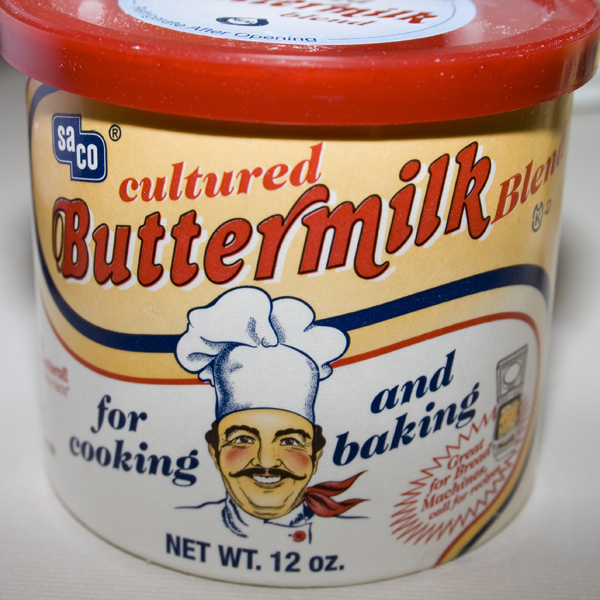 Buttermilk. Except, I didn’t have any in my fridge. I did have this can of the powdered kind though, which worked perfectly! Once the batter comes together, fill your liners halfway. Top with streusel and then another bit of batter. 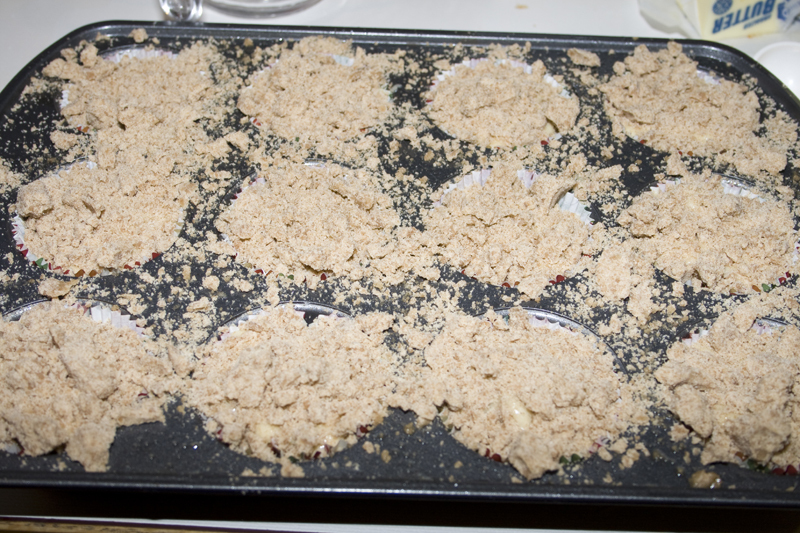 The two closest in this shot have their streusel, the rest already have their top coat of batter. Then top with MORE streusel. Pile it on there. I told you this recipe was genius. And, that you’d need to grease between your cupcakes. Can you imagine if all that gorgeous streusel stuck to your pan? 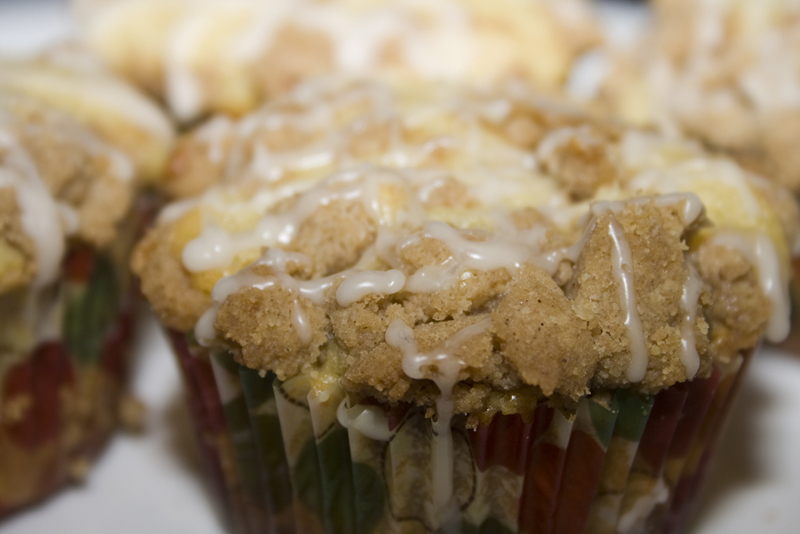 I suppose I could attempt to keep the streusel only on top of the muffins…what can I say? I’m a messy baker. Bake and then drizzle with a little glaze goodness. Come to mama. Seriously good stuff here folks. When I brought these to my Nanny’s house for de-Christmasifiying (what, that’s not a word? ), my mom as usual started picking off the tops. 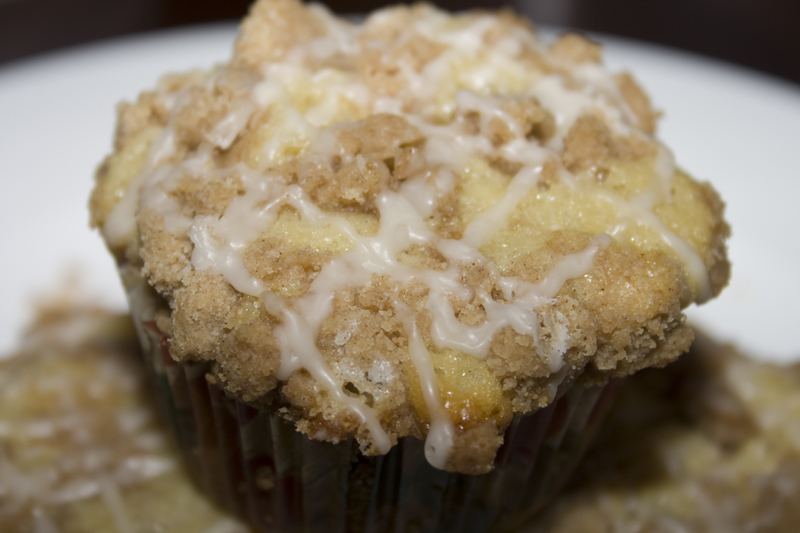 However since there’s streusel most of the way thru the muffin, I think she actually finished a whole one. All that streusel…I’ve gone to my happy place now. Preheat oven to 350F. 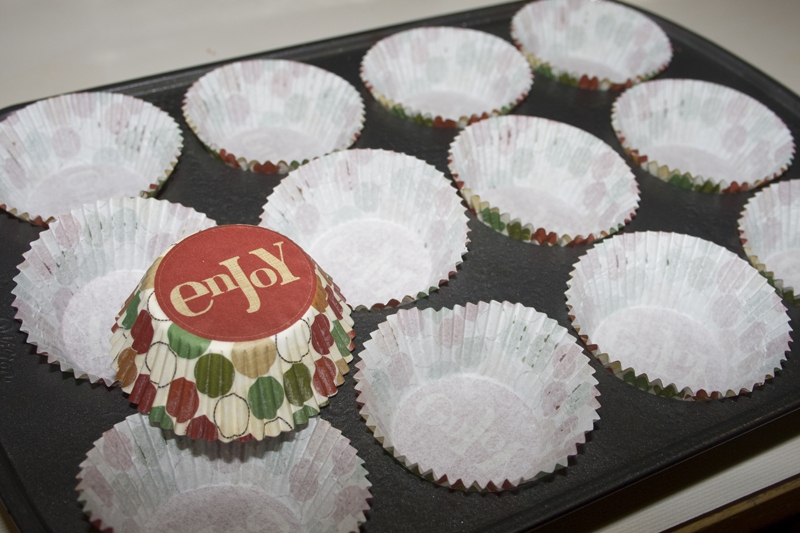 Line 24 muffin cups with paper liners. Prepare the streusel first. 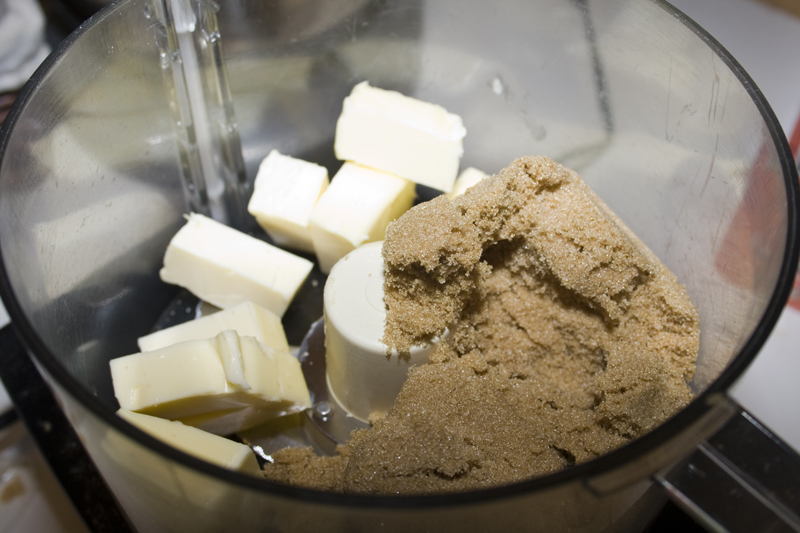 In a large bowl, cream together butter and brown sugar until light. Beat in ground cinnamon, salt and vanilla. Working at a low speed, blend on the flour slowly until it all has been incorporated. Mixture should look sandy and coarse. Prepare the cake batter. In a medium bowl, whisk together flour, baking soda, baking powder and salt. In a large bowl, cream together butter and sugar until light. Beat in eggs one at a time, followed by vanilla extract. 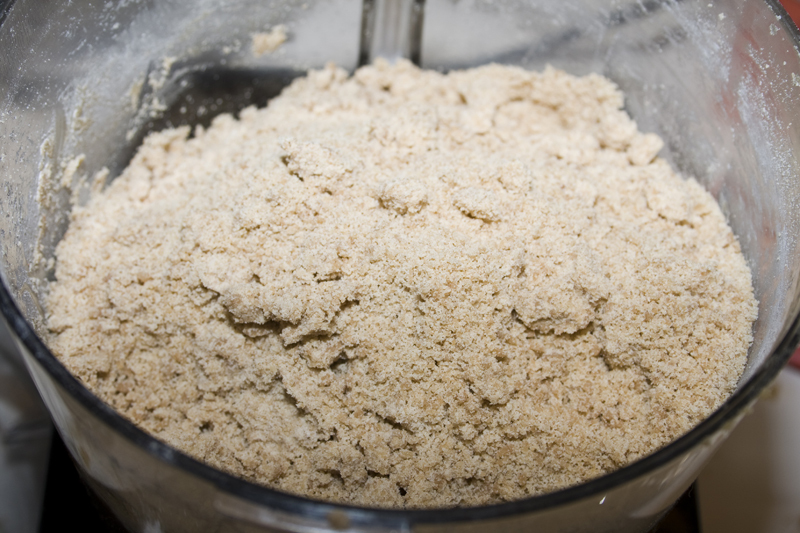 Working in two or three additions, alternate mixing in some of the flour mixture and some of the buttermilk, ending with an addition of the flour. Mix only until everything is just combined and no streaks of dry ingredients remain. Fill each of the muffin cups a bit less than half way up. Top each with a small handful of streusel. Divide remaining batter evenly over the muffin cups. Top each with a generous handful of streusel. 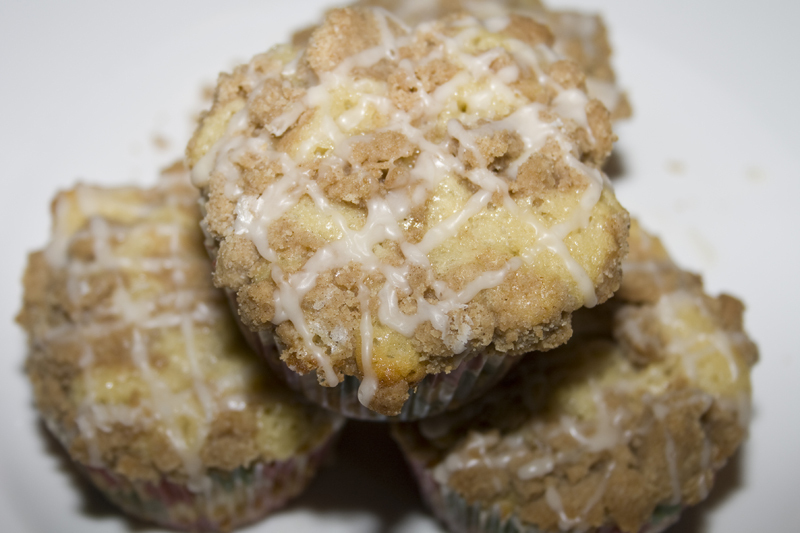 If you squeeze the streusel tightly in your hand before placing it on the muffins, it will form nice clumps. Be sure to use all the streusel. 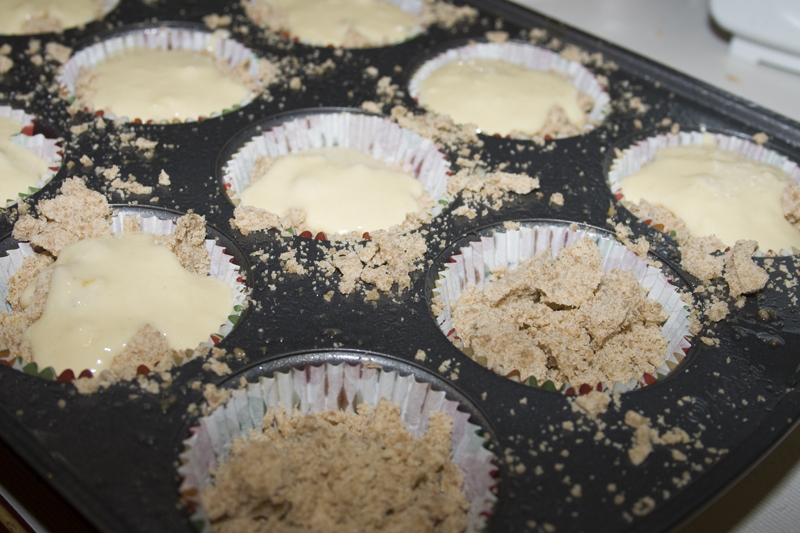 Bake for 17-20 minutes, or until a toothpick inserted into the center comes out clean and the streusel is lightly browned. 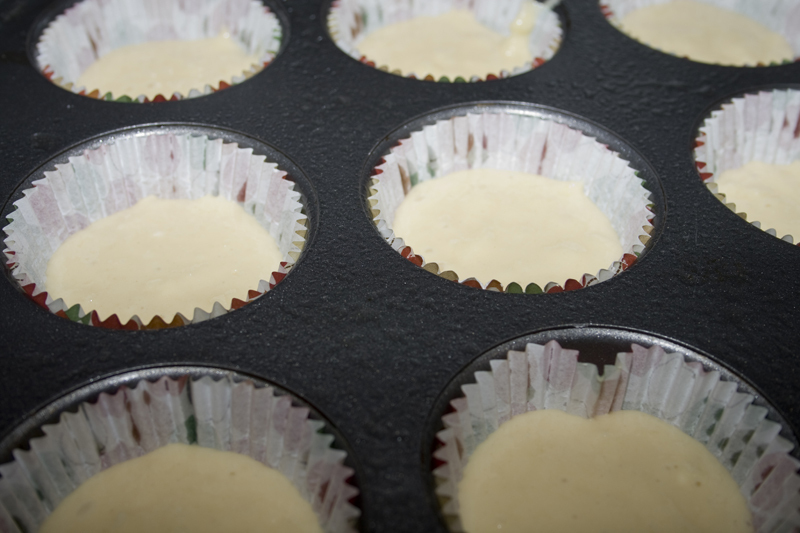 Carefully remove from muffin tin and cool completely on a wire rack before icing. Allow icing to set before storing. 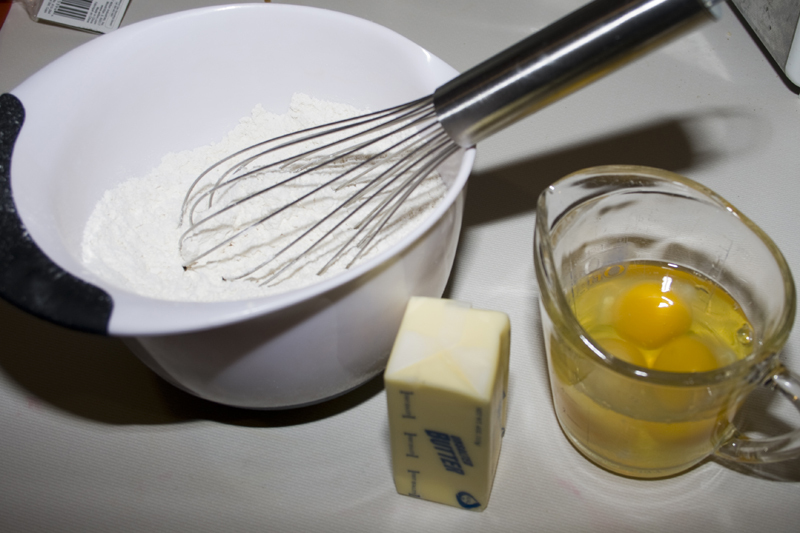 Whisk all ingredients together in a small bowl. Drizzle over completely cooled cupcakes. Another great recipe! And the pictures show, the result is going to be really yummy! My grandma used to bake “Streuselkuchen” something similar but without coffee! I`ll try this one myself as soon as possible.